Ven. 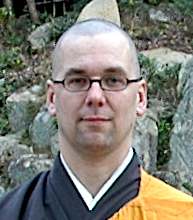 Gomyo Kevin Seperic- Ajari is a Shingon Buddhist priest. Born in Lansing, Michigan, he now lives and teaches in Okayama, Japan. He is also a researcher for Shuchi-in Daigaku, a Buddhist University in Kyoto, which was founded by Kobo Daishi Kukai in the ninth century. Originally coming to Buddhism through an interest in zazen, which he began practicing in 1993, he became fascinated with Kobo Daishi and the practices of the Shingon school while walking the 1100km (700 mile) Shikoku Pilgrimage for the first time in 1996. His interest in and involvement with Shingon grew and he was eventually ordained as a Shingon monk at Zentsu-ji in 2000. In 2002 and 2003 he trained with the Venerable Shodo Habukawa Jogo at Muryoko-in on Mount Koya. 2004 was spent training with the Venerable Soko Saeki Sojo at Rendai-ji on Mount Yuga and in December of that year he became the first non-Japanese to receive a Dharma transmission in the Omuro school of Shingon at Ninna-ji in Kyoto. His interest in the Shikoku Pilgrimage has also continued, completing the trek a total of four times on foot and once by motorcyle. In 2006 he was recognized by the Shikoku Pilgrimage Temple Association and given the official title of 'Sendatsu', or pilgrim guide, and began leading walking pilgrims or "henro" around the Island of Shikoku in the spring of 2007. Gomyo is also a street artist, and spends much of his time using this art form as both a meditative practice and teaching tool. He believes this to be an important aspect of his work. Being involved in street culture has given him the chance to introduce Buddhist practice to youth who might otherwise not have had that opportunity. Currently he is working on a book entitled "Hoodie Monks," about his experiences with Buddhism and street art in Japan and how the two worlds came together in his life and are coming together in the lives of many young people.